To fully understand yucca nutrition, it's important to distinguish between different types of yucca and their common uses. Yucca root, also called "yuca," is the root of the cassava plant. This vegetable is often boiled or fried like a potato and consumed as a snack or a side dish. However, there are over forty other variations of yucca. Yucca is a common name for a genus of shrubs that grows in warm climates and has sharp, spear-shaped leaves. These yucca plants—including banana yucca, Mojave yucca, and beaked yucca—are often used medicinally and usually not consumed as a food. One cassava root is about 400 grams. A single serving of cassava is about 1 cup or slightly over 200 grams. One cup of yucca provides about 330 calories. But yucca is usually not consumed raw. You are more likely to see cassava or yucca chips or fries. A single serving of yucca chips (28 grams) provides approximately 130 to 150 calories and 5 to 8 grams of fat. The calories in yuca fries will vary depending on how they are prepared and the serving size. For example, if you eat about 10 yucca fries (also called yuca fries or cassava fries) you may consume anywhere from 200–275 calories and 13–18 grams of fat. Yucca is a starchy vegetable that will significantly boost your carb intake. There are about 78 grams of carbohydrate in 1 cup of raw cassava (yuca), according to USDA data. Just under 4 grams of that is fiber and about 3.5 grams is sugar. The rest of the carbohydrate in yucca is starch. The estimated glycemic load of yucca is 41, which makes yucca a high glycemic food. There is very little fat (less than 1 gram) in a single serving of raw yucca. One cup has less than a single gram of fat and one whole root has just over 1 gram of fat. However, if you consume fried yucca, the food is likely to have quite a bit of fat because it is cooked in oil. Yucca fries and yucca chips may have up to 8 grams of fat or more, depending on how they are prepared. Yucca provides a small amount of protein in the raw form. One cup contains just under 3 grams of protein. Fried yucca is not likely to provide any additional protein. Yucca root provides both vitamins and minerals. Vitamins in yucca include vitamin A (28.6 IU), vitamin C (42 mg), folate (56 mg), choline (49 mg), vitamin K (4 mcg), and small amounts of thiamin, riboflavin, niacin, vitamin B6, pantothenic acid, and betaine. Minerals in yucca include calcium (33 mg), magnesium (43 mg), phosphorus (56 mg), potassium (558 mg), sodium (29 mg), manganese (0.8 mg), and small amounts of zinc and selenium. Yucca and yucca extract consumed by mouth has been used to lower blood pressure and manage high cholesterol. Natural product guides that write about the use of yucca for medicinal purposes note that using yucca (or yucca extract) must be combined with a healthy diet and exercise program in order to benefit from any effect. So it is unclear if it is the yucca consumption or the lifestyle changes that provide a benefit. Yucca is sometimes on the skin to reduce inflammation, bleeding, sprains, broken limbs, joint pain, baldness, and dandruff. There is some evidence to support the anti-inflammatory benefits and anti-arthritic effects of yucca. However, in published research, scientists state that more research is needed to verify these benefits in humans. There is some evidence that using yucca topically may help alleviate skin sores, specifically herpes simplex virus type 1 and type 2. But more research on humans is needed. How do you say "yucca"? The proper pronunciation of the word depends on the type of yucca that you are referring to. When you are talking about the plant with long, spear-like leaves, it is pronounced "yuck-ka." 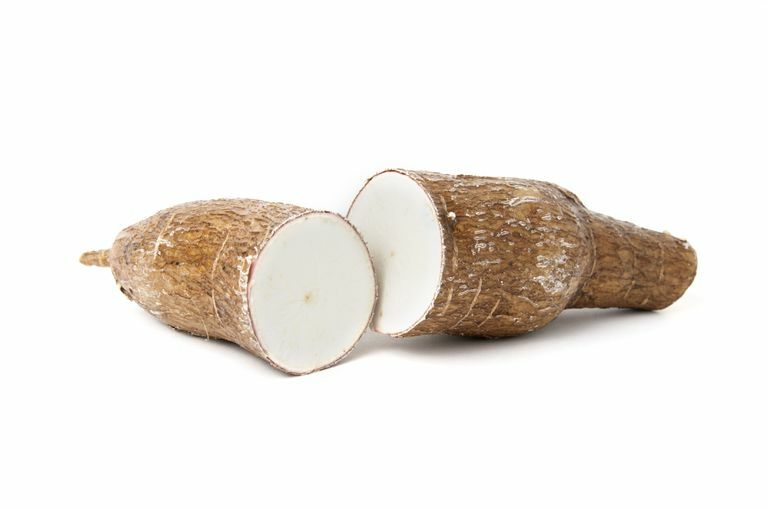 However, if you are referring to yuca or the cassava root vegetable, it is pronounced "yoo-ka." How and where can I buy yucca? Some—but not all—grocery stores sell yucca in the produce section of the market. You'll find yucca near other root vegetables like potatoes, turnips, or yams. Look for a reddish-brown, club-shaped vegetable that is firm and solid and has few blemishes. Keep in mind that the bark-like skin is removed before cooking, so dirt or mild blemishes are not a problem. Yucca has a starchy taste and texture similar to that of a potato, but it is slightly sweeter and nuttier than a potato. The most common way to prepare yucca is to fry it. However, this adds fat and calories to the food, so the National Institutes of Health and other nutrition organizations provide recipes to bake yuca fries instead. A single serving of baked yuca fries provides under 100 calories and about 1 gram of fat. You can also boil yucca and season with salt or use it in the same ways that you might use a potato. Yucca is likely safe when consumed in amounts typically found in food. Certain types of yucca (Mojave yucca and Joshua tree) are recognized as GRAS (Generally Recognized as Safe) by the USDA. According to medical sources, yucca is likely to be safe for consumption but may cause diarrhea if consumed in excess. Also, it is not known if yucca is safe for those with severe liver or kidney disease, children, and pregnant or nursing women. Patel, S. Nat. Prod. Bioprospect. Yucca: A medicinally significant genus with manifold therapeutic attributes. (2012) 2: 231. DOI: 10.1007/s13659-012-0090-4. Hayashi, K., Nishino, H., Niwayama, S., Shiraki, K., & Hiramatsu, A. (1992). Yucca leaf protein (YLP) stops the protein synthesis in HSV-infected cells and inhibits virus replication. Antiviral Research, 17(4), 323–333. DOI: 10.1016/0166-3542(92)90027-3. Cheeke PR, Piacente S, Oleszek W. Anti-inflammatory and anti-arthritic effects of Yucca schidigera: a review. J Inflamm (Lond). 2006;3:6. Published 2006 Mar 29. DOI: 10.1186/1476-9255-3-6.